The year started with Chenese still displaced from the devastating flood of 2016. However, this setback did not deter Chenese from achieving success in 2018, as she continued to rise above adversity and thrive. 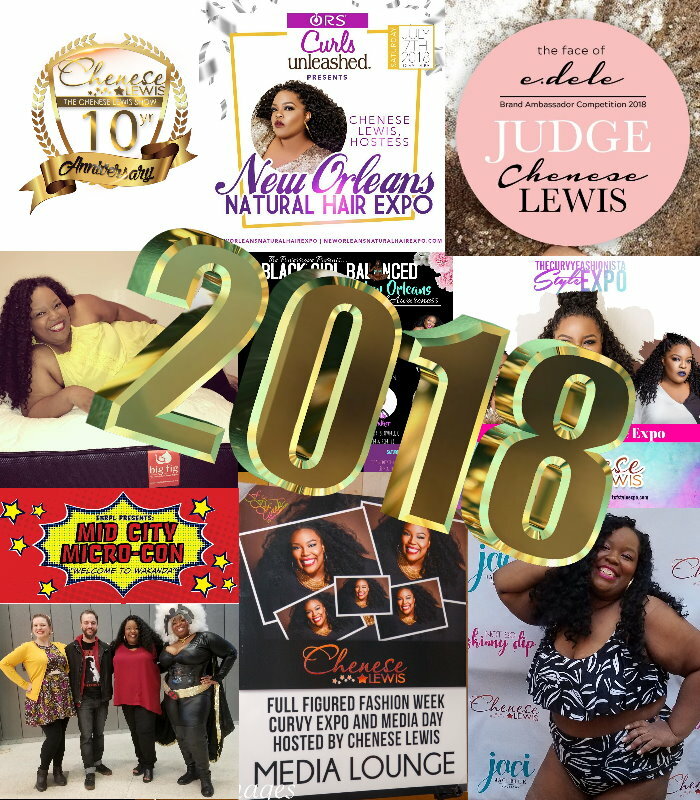 Chenese returned as host of the New Orleans Natural Hair Expo during the Essence Music Festival weekend for the fifth consecutive year and served as the moderator for a panel discussion with some of the industry’s most influential natural hair vloggers and CEOs of national haircare brands. She also returned to host the TCFStyle Expo in Atlanta for the fourth consecutive year, co-hosting with Atlanta radio personality, V103’s Big Ray. In an unexpected move, Chenese made her debut as host for the launch of Full Figured Fashion Week Media Day during their ten-year anniversary celebration and hosted their first Twitter chat, as well as interviewed top brands, designers, and influencers during the festivities in New York City. Chenese had the opportunity to connect and collaborate with many brands this year. She served as a special guest for Jaci Blue Boutique’s inaugural Not So Skinny Dip: Curvy Girl Pool Party in New Orleans, returned as a judge for the second annual Ms. Full Figured Louisiana Pageant, and judged the “Face of E.Dele Brand Ambassador Competition” which helped to launch the jewelry brand. As an influencer, she received a Big Fig Mattress, products from ORS Haircare, and swimwear from JCPenny’s Boutique Plus swim collection. Continuing to expand her brand in diverse markets, she served as moderator for the “Body Image in Comics and Cosplay” panel discussion at the inaugural Mid City Micro-Con. Hosted by the East Baton Rouge Parish Library System, the comic convention’s theme “Welcome to Wakanda,” highlighted Marvel’s Black Panther and celebrated diversity in comics. She also was a panelist on the “Black Women in Society” panel discussion at Black Girl Balanced: A Day of Self-Care and Awareness, an event dedicated to celebrating and empowering women of color. 2018 marked the 10-year anniversary of The Chenese Lewis Show. Remaining the most influential podcast for the plus industry, top bloggers, models, and influencers were featured on the show. Notable guests included Baseball superstar Mo Vaughn, former three-time MLB All-Star, 1995 MVP, and co-founder of MVP Collection for big and tall men; Ashley Neil Tipton, winner of Project Runway season 14; actress Jen Poten from AMC’s groundbreaking drama Dietland; award-winning actress and comedian Erica Watson, face of the Avenue’s “Confidence Series” campaign; Teresa Royals, the first to win Ashley Stewart’s nationwide “Finding Ashley Stewart” competition; and many more. The show also served as media sponsor for some of the most prestigious events in the plus industry. Chenese was mentioned in the Sept 2018 issue of O Magazine in the “Size Wise” article which spotlighted plus size influencers. The article quoted Marie Denee, of The Curvy Fashionista, in which she referred to Chenese as a pioneer in the plus size fashion movement.